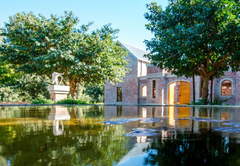 Fort is a property providing self catering in Gouda for up to 80 guests visiting the Cape Winelands region. 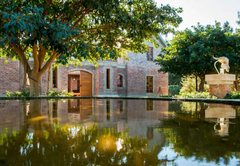 Situated on the banks of the Berg River, Buffalo Drift boasts a spectacular “Fort”. 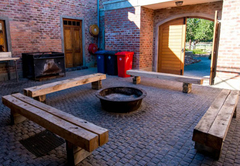 This facility can comfortably accommodate large groups of people with its multiple sleeping arrangements. 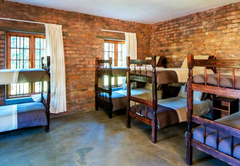 The Fort is booked exclusively for one group and houses two dorm rooms and four double en-suite rooms in the downstairs section. Students and party-goers are able to make use of the dorm style male and female ablutions. 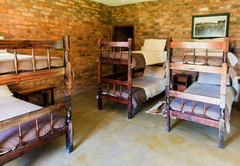 Parents will love escaping to one of four private double rooms whilst the kids entertain themselves. Dorm style rooms have bunk beds and each room has a bathroom. There is a larger dorm room in the upstairs area. This section boasts a deck complete with fridges / freezer. 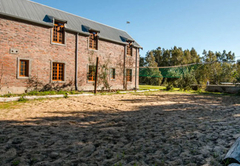 The fully equipped kitchen has a walk in refrigerator as well as a scullery. Bring your own food and drinks along or let us do the cooking if you would prefer. Breakfast and lunch can be arranged with prior notice by one of our outside catering teams. For dinner we can order a delicious lamb or pork spit served with roast potatoes, onions, seasonal vegetables and fresh bread. Enjoy canoeing, fishing, swimming and beach volley ball free of charge. Clay pigeon shooting can be arranged at an additional fee. Situated on the farm outside Gouda. 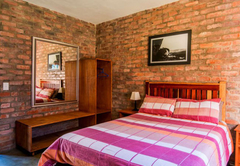 4 double en suite bedrooms, 3 dorm rooms with bunk beds. 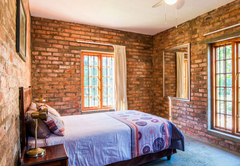 Each room has a shower, basin and toilet. Response timeFort typically responds to requests in 5-10 minutes.